Getting to Cuyamaca Rancho State Park always takes longer than I think it does. I left the house at 6AM and didn't get on the trail until 8AM, as I have to take into consideration picking up the PD, getting breakfast to go, and driving out to the park. Regardless, we arrived at Paso Picacho and were instantly chilled by the wind blasting through the valley. I was glad that I had brought extra layers, even though the weather report indicated that the high would be hovering near 70 degrees. I had lofty goals for the day. I wanted to climb up and over Cuyamaca Peak, summiting Japacha Peak and heading down to Airplane Ridge and Arrowmakers Ridge and loop all the way back to our starting point. A hike of over 14 miles. Sure, I wanted to add 4 peaks to my total, but I also wanted to get a good training hike for my upcoming trip to Mount Whitney. What better way to accomplish this than to spend a day of hiking in some of the highest elevation in San Diego? We headed up the fire road, already noticing the effect of the higher elevation on our lungs. How would it be at twice the elevation in the Sierras? We warmed up and got a good pace going and made it to the top in about an hour. The way up was littered with constant reminders of the 2003 Cedar fire. Charred earth and dead trees were scattered everywhere. In some places, we could still see ash, but this may have been from more recent controlled burns; it's hard to tell. It's going to take a long time for this mountain to get back to where it was, but volunteers are doing their best by planting saplings all over its side. Once at the top, we couldn't easily get a 360 degree view of the county, but the view was pretty spectacular. Only one mountain is higher in San Diego County, which is Hot Springs Mountain, miles away to the north. We walked around the peak structures, looking for some shelter from the icy wind, which periodically slammed into us from the north. We ended up resting on a concrete slab on the southern edge of the peak and were joined by another family, who must have left at about the same time we did. On the way up, I thought I saw a guy who looked just like I would imagine Jerry Schad would look like these days, but with a beard. He was lugging a tripod and a large camera bag down the road. We then descended to an unpaved trail that headed towards Japacha Peak. We made excellent time on the soft pine needles and ultimately made it to the top of Japacha Peak, which is about 800 feet lower than Cuyamaca Peak. The views were pretty similar, but the bushwhack to the top provided some excitement. We had another snack, enjoyed the view and the warming day and headed back down, hoping to summit two more peaks before the day got too late. The trail leading down the mountain was comprised of many switchbacks and got progressively overgrown as we descended. We noticed some amber caterpillars with black spikes and thought they were cool. We tromped along the trail through a lot of green overgrowth with our forearms in front of our faces for about five minutes before we realized that the bushes were covered with clumps of these caterpillars. And they were getting all over us. And the black spikes were covered with an irritant. From then on, we were more careful about checking each other. Some had made their way into my camera bags and were on my shorts. One had attached itself to my shin, causing an itchy/burning sensation. Caterpillars twitching and clumping on the trail. They sting! After a couple of miles, the trail opened up to steep grasslands with occasional oaks. This was by far my favorite part of the hike. The wind swept the grass, making it look like a lake of green and brown. All around us we could see distant peaks and meadows. It was truly beautiful and definitely a place worth visiting, even if you aren't looking to bag a peak. We saw some hikers making their way up as we approached Airplane Ridge. We saw a snake basking on the trail. It was a beautiful white, great and blue (not a rattler) and slithered away after I almost stepped on it. Too quick for a picture. After a short bushwhack, we were on top, being buffeted by the ever-present wind of the day, but were presented with an amazing view of the south, unmistakable Stonewall Peak looming to the north, as well as the ridge that leads straight up to Japacha Peak. We were starting to feel the mileage, but were on a roll. We rambled back down and continued losing elevation. We took a few minutes to visit the Airplane Monument. From the monument, we started to hear some chainsaws in the distance. After a few small stream crossings, we came across a man and a woman, armed with chainsaws, who were loading two horses who were pleasantly munching on the dense foliage. They were very friendly and knowledgeable, taught me the correct pronunciation of Japacha (haw puh SHAW) and shook their heads when I asked them if they would be trimming back the heavily overgrown trail above us. There was no funding. They were volunteers who were only trimming the large logs that hikers could not move. After too much fun, though we were tempted to stay and chat longer, we were on our way to the West Mesa, where we met several groups of people on horseback. We were really on a roll now. We had our rhythm and the miles were flying by. We got to Arrowmakers Ridge and scrambled to the top, gently avoiding the freshly-planted saplings. I slipped while climbing over a large log and turned my ankle, which was still a little weak from a pretty decent turn from my hike to Cedar Creek Falls. It bothered me for the rest of the day. I have got to be more careful. A lot of work has been done to restore Cuyamaca Rancho State Park to its former glory, but, I tell you, it's pretty amazing now. I can't imagine how beautiful it was before the fires. 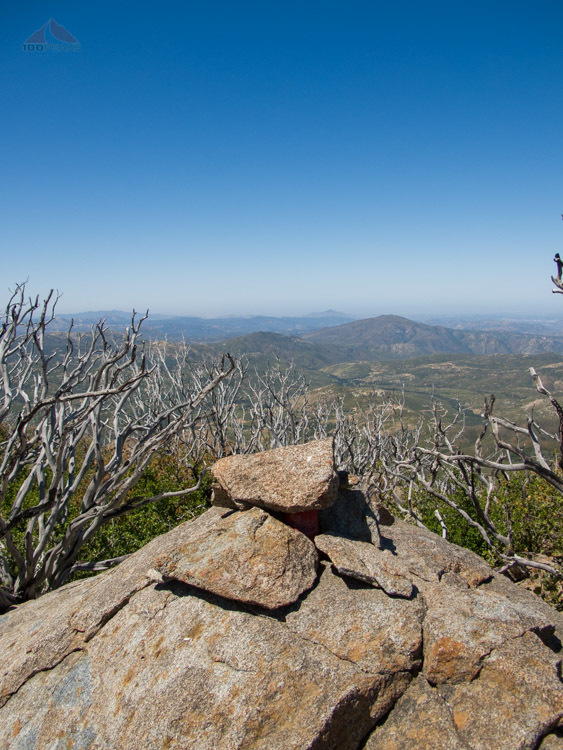 Atop the ridge, we could see Oakzanita Peak, Cuyamaca Peak and Japacha Peak, among others. Tired and sore, we made it back down to the trail and began to make the uphill climb back to Paso Picacho. About a half mile from the trailhead, we spied a deer in the meadow ahead of us. Pretty cool. 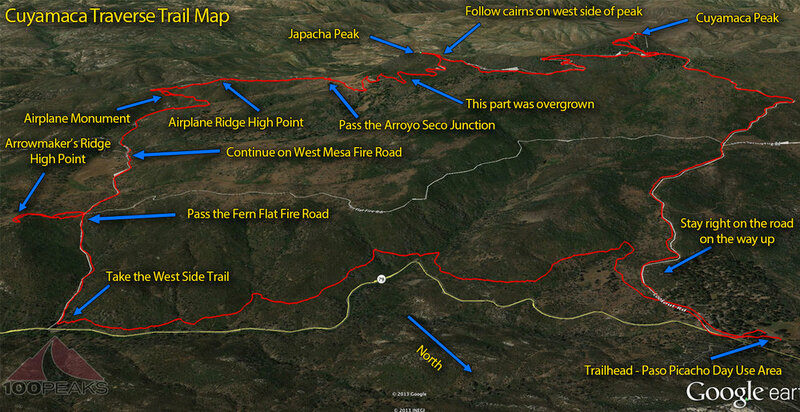 In over 14 miles of hiking, I felt like we got the grand tour of much of the western portion of Cuyamaca. The area is incredible. Although Cuyamaca Peak is one of the most popular hikes in the park, I felt like it was the least scenic. The area around the paved road is pretty desolate and the view is great, but you are sharing space with the humming machinery on the top. Once away from the peak, the area felt like a secret wilderness with streams, stunning grasslands with sweeping vistas. There is still a little green, but it will all be brown soon. It will still be worth it.